This leaf comes from a German Bible of the late fifteenth century. Measuring 41cm x 28cm, the vellum is slightly yellowed, thick, and easily bent. There is only vertical evidence of lining, which is done in red. The bulk of the text is in dark brown with red decoration. Dóminus ut ædificáres domum sanctuárii, confortáre, et pérfice. 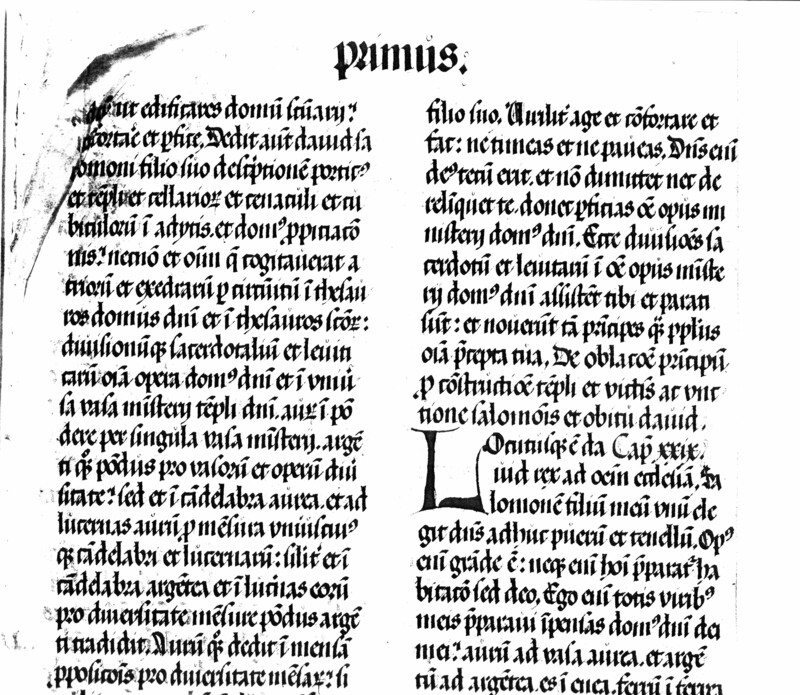 11 Dedit autem David Salomóni fílio suo descriptiónem pórticus, et templi, et cellariórum, et cœnáculi, et cubiculórum in ádytis, et domus propitiatiónis, 12 necnon et ómnium quæ cogitáverat atriórum et exedrárum per circúitum in thesáuros domus Dómini, et in thesáuros sanctórum, 13 divisionúmque sacerdotálium et Leviticárum, in ómnia ópera domus Dómini, et in univérsa vasa ministérii templi Dómini. 14 Aurum in póndere per síngula vasa ministérii. Argénti quoque pondus pro vasórum et óperum diversitáte. 15 Sed et in candelábra áurea, et ad lucérnas eórum, aurum pro mensúra uniuscujúsque candelábri et lucernárum. Simíliter et in candelábra argéntea, et in lucérnas eórum, pro diversitáte mensúræ, pondus argénti trádidit. 16 Aurum quoque dedit in mensas propositiónis pro diversitáte mensárum : simíliter et argéntum in álias mensas argénteas. 17 Ad fuscínulas quoque, et phíalas, et thuríbula ex auro puríssimo, et leúnculos áureos pro qualitáte mensúræ pondus distríbuit in leúnculum et leúnculum. Simíliter et in leónes argénteos divérsum argénti pondus separávit. 18 Altári autem, in quo adolétur incénsum, aurum puríssimum dedit : ut ex ipso fíeret similitúdo quadrígæ chérubim extendéntium alas, et velántium arcam fóederis Dómini. 19 Ómnia, inquit, venérunt scripta manu Dómini ad me, ut intellígerem univérsa ópera exempláris. 20 Dixit quoque David Salomóni fílio suo : Viríliter age, et confortáre, et fac : ne tímeas, et ne páveas : Dóminus enim Deus meus tecum erit, et non dimíttet te nec derelínquet, donec perfícias omne opus ministérii domus Dómini. 21 Ecce divisiónes sacerdótum et Levitárum : in omne ministérium domus Dómini assístunt tibi, et paráti sunt, et novérunt tam príncipes quam pópulus fácere ómnia præcépta tua. 10 Now therefore seeing the Lord hath chosen thee to build the house of the sanctuary, take courage, and do it.11 And David gave to Solomon his son a description of the porch, and of the temple, and of the treasures, and of the upper floor, and of the inner chambers, and of the house for the mercy seat, 12 As also of all the courts, which he had in his thought, and of the chambers round about, for the treasures of the house of the Lord, and for the treasures of the consecrated things, 13 And of the divisions of the priests and of the Levites, for all the works of the house of the Lord, and for all the vessels of the service of the temple of the Lord. 14 Gold by weight for every vessel for the ministry. And silver by weight according to the diversity of the vessels and uses. 15 He gave also gold for the golden candlesticks, and their lamps, according to the dimensions of every candlestick, and the lamps thereof. In like manner also he gave silver by weight for the silver candlesticks, and for their lamps according to the diversity of the dimensions of them. 16 He gave also gold for the tables of proposition, according to the diversity of the tables: in like manner also silver for other tables of silver. 17 For fleshhooks also, and bowls, and censers of fine gold, and for little lions of gold, according to the measure he gave by weight, for every lion. In like manner also for lions of silver he set aside a different weight of silver. 18 And for the altar of incense, he gave the purest gold: and to make the likeness of the chariot of the cherubims spreading their wings, and covering the ark of the covenant of the Lord. 19 All these things, said he, came to me written by the hand of the Lord that I might understand all the works of the pattern. 20 And David said to Solomon his son: Act like a man, and take courage, and do: fear not, and be not dismayed: for the Lord my God will be with thee, and will not leave thee, nor forsake thee, till thou hast finished all the work for the service of the house of the Lord. 21 Behold the courses of the priests and the Levites, for every ministry of the house of the Lord, stand by thee, and are ready, and both the princes, and the people know how to execute all thy commandments. 1 And king David said to all the assembly: Solomon my son, whom alone God hath chosen, is as yet young and tender: and the work is great, for a house is prepared not for man, but for God. 2 And I with all my ability have prepared the expenses for the house of my God. Gold for vessels of gold, and silver for vessels of silver, brass for things of brass, iron for things of iron, wood for things of wood: and onyx stones, and stones like alabaster, and of divers colours, and all manner of precious stones, and marble of Paros in great abundance. 3 Now over and above the things which I have offered into the house of my God I give of my own proper goods, gold and silver for the temple of my God, beside what things I have prepared for the holy house. 4 Three thousand talents of gold of the gold of Ophir: and seven thousand talents of refined silver, to overlay the walls of the temple. 5 And gold for wheresoever there is need of gold: and silver for wheresoever there is need of silver, for the works to be made by the hands of the artificers: now if any man is willing to offer, let him fill his hand to day, and offer what he pleaseth to the Lord.